Put away the sticks...No more Princeton Hockey...because Spring is here and the French Market opened on Friday April 10th at Mercer Island Park, intersection of Nassau and Mercer Streets in Princeton. Open every Friday morning, 8:30 to 11:30am through June 5th. Parking is free for customers when flowered hats sit on the meters. 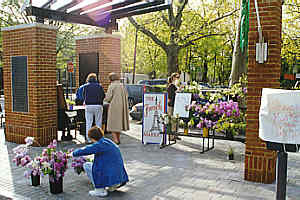 Co-chairs of the Market, a project of the Garden Club of Princeton, are Milly King, Cookie Leaper and Mary O'Leary. There are flowers from member's gardens such as lillies of the valley, daffodils, iris, roses, lilacs, flowering branches, small arrangements, herb planted strawberry jars, some perennials, blooming flower bulbs, garden implements and fresh eggs. In additon, Bloomsavers, a device for carrying cut flowers will be for sale, as well as unusual plant containers and other things useful to the gardener. 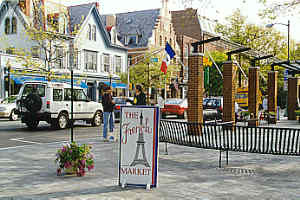 Mercer Park was refurbished last year by the Garden Club of Princeton with help from Princeton Borough. Members of the club are busy supervising the planting of the park and have designed colorful banners which will be flown on the flag poles when the French Market is open. 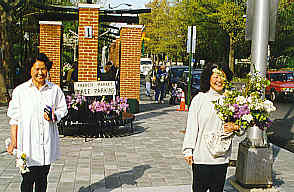 Proceeds from the 1998 Spring Market will go to civic projetcs benefiting the greater Princeton community.